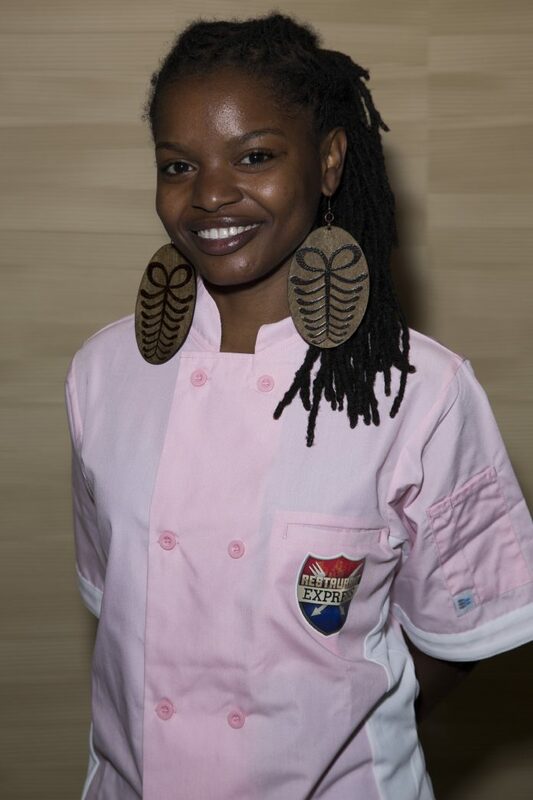 A graduate of Le Cordon Bleu and the owner of a company called Intimate Chef of Atlanta, Ameerah Watson will appear on Robert Irvine’s Food Network show “Restaurant Express” Sunday at 9 p.m. The 27-year-old single mother and former Ritz-Carlton, Buckhead chef recently competed against eight others for an executive chef position at the M Resort Spa Casino in Las Vegas. Though she’s keeping mum about the outcome of the challenges—which test both culinary and business skills—Watson gave us a glimpse into her life on and off the show. When I was young, my mother would always let me pull up a chair [while she was cooking]. My grandparents had a farm and I enjoyed making jams and desserts there. In ninth grade, I really started to get the hang of cooking. I had a passion for it. I love eating good food. After high school, I went straight to culinary school. How do you describe your method of cooking? My cuisine is made up of healthy cooking, fresh produce, and a farm-to-table approach. I’m from New Orleans and Atlanta, so I’m health conscious but also Southern. How did you end up on “Restaurant Express”? One day I was sitting on my couch and got a phone call to ask if I was interested in doing the show. They found my information online! I’d always respected and watched the Food Network. I’d gotten good ideas from Emeril; twice-baked potatoes was a signature for me. When they asked if I was interested in winning a restaurant, I couldn’t turn it down. I learned to always stay committed to your passion and put your best foot forward until you’re satisfied that the job is done. Above all of that, make sure your personality shines through your food. It showed me what I’m capable of. It’s a pressured situation. It pushes you to show you are limitless. Being away from your family and isolated, with no phone, no Internet—sometimes you don’t even know what time it is. I have a daughter and my family’s always been supportive, so that was difficult. I’ve picked up and learned a lot over the years. It’s about the food, but it’s also about being marketable and financially stable. [On “Restaurant Express”], you had to identify room for improvement and show you know how to learn as well. How were the interactions between you and the other contestants? We were all treated the same and in the same isolated situation, so we sought kinship out. There was a lot to learn from everyone. We’re all Facebook friends now. If your dream came true, what kind of restaurant would you like to open? My dream restaurant would be built around the basis of health. I like to focus on aphrodisiac cooking for the health aspect. Aphrodisiacs balance you out. I want to give people emotional food, similar to in the movie Like Water for Chocolate. It’s about a woman who cooked with such emotion that people could feel it when they ate her food. I’m very passionate about my work. I’m more interested in showing people how to eat healthy food without thinking it’s rabbit food. As the youngest chef competitor, did you feel you had to overcompensate to prove yourself? I always put my best foot forward. I had the second most experience of everyone in the group. I’ve been in the restaurant business for more than ten years. I’ve been a caterer and a private chef. I work with nonprofits and do a school lunch program. My age didn’t make me feel uncomfortable because I am confident in what I can do.